We have reached that hard, cold part of the year. When the parties are over, we all resolve to ramp back on calories and eat better. It is critical to use a little ingenuity to inject some flavor and joy into meals. Now is the time to try something new and different. Perhaps something that reminds you of summer at the ocean. It has to taste rich, healthy and fresh. It should be packed with protein and low in calories, a virtual cheat of a meal for Weight Watchers points. It also has to be versatile-a meal in itself for one or two, or tossed with pasta to serve a crowd. One of my favorite answers to this list of needs is bay scallops. They are really inexpensive when you think about using a pound to feed four or more folks. And they can be ready ten minutes from start to finish. You can now find individually quick frozen bay scallops with no preservatives in your grocer's freezer section. Scallops make your mealtime easy if you follow a few tips. Make sure you read the label and don't settle for anything added....you want just plain scallops without any preservatives. Thaw them out in the refrigerator during the day and prepare them for dinner almost any way you can think of-baked, fried, sautéed or tossed in a sauce. Remember you need to cook them quickly-over cooking them turn tiny nuggets of fresh sweet flavor into rubbery pellets. So, prepare all your ingredients and get ready for supper before you start the actual cooking or you may be saddened to lose all that great flavor. They really do only take minutes to cook! I have four recipes you might want to try. 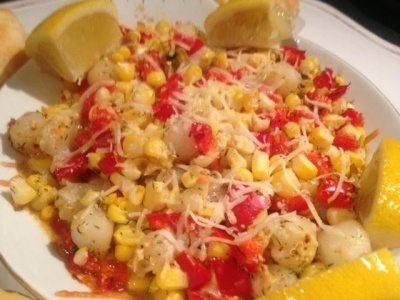 One is clearly a winner for dieters that pairs the slightly sweet flavor of scallops with sweet corn and red bell peppers. Another accents the rich, velvety texture of scallops with mushrooms and cream. All of them take less than twenty minutes from start to finish and can be enjoyed by a couple or a crowd. Here's to a touch of luxury in the cold drab days! In a large skillet over medium heat, cook the mushrooms and onions in the olive oil until they are soft and starting to turn golden brown. Add the garlic, herbs and scallops. Cook for three minutes then push all the ingredients to one side of the skillet. Melt the butter in the open space and add the flour to it, stirring to make a small roux in that side of the pan. Once the flour is incorporated with the butter, stir all the ingredients together and slowly add the milk and wine, stirring constantly until everything is combined. Cook for another few minutes until the sauce thickens. This can be served as a casserole by itself or over grits, rice or noodles for a large meal. Toss all the ingredients together in a bowl, then place either in a large greased casserole dish or into four greased smaller casseroles. Bake at 400oF for 20 minutes or until the scallops are just cooked through. You can serve this as an entrée with a little more cheese on top or toss it with pasta for a bigger meal. Use one tablespoon of the butter to grease the insides of six small or four large individual casserole dishes. Divide the scallops between the dishes. Sprinkle them with the garlic and the wine. Cover them with the breadcrumbs and dot the breadcrumbs with the rest of the butter. Bake in a 400oF oven for fifteen minutes, or broil for five to ten minutes, until the casseroles are hot and bubbling. Cook the pasta according to package instructions. Drain and keep the pasta warm. Sauté the garlic, onions, peppers, carrots and mushrooms in the garlic oil until the onions are soft and the mushrooms are golden brown. Add the scallops and the wine. Cook on medium high for about three to five minutes, or until the scallops are slightly opaque. Add the pasta, parsley and cheese and toss to combine. Serve hot with capers as a garnish on top, and extra Parmesan available.